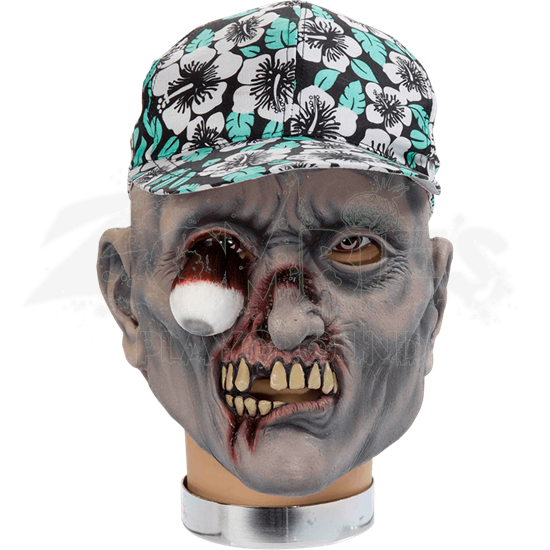 The Percy Zombie Mask with Hat is a unique accessory that can add a bit of color to the typical zombie look, depicting a grim and grey faced zombie adorned with a colorful hat with floral patterning. This mask depicts a gruesome looking zombie that looks almost as though it may have been turned while on vacation. Adorning the top of this zombies head is a baseball cap decorated with flowers, all done in black, white, and pale sea green. The zombies skin is a faded color of gray-brown. One of the eyeballs has popped out of the socket, adding to the masks gory detail. The masks mouth is parted in a hungry sneer, while a dried, bloody gash runs across the masks nose and mouth. This mask features two eye slits that enable the wearer to see quite well when wearing the mask, as well as an open mouth for convenience. It is designed to be worn over the head, providing full coverage for the wearer. Given the colors on the Percy Zombie Mask with Hat, you could use it with a variety of different zombies, ranging from tropical zombie, to zombie on vacation, or even just a zombie that is a little more difficult to overlook, because of its brightly colored hat.